Christ The King Lutheran Church was founded in 1961 and is the church home to members from Newtown, Southbury, Bethel, Danbury, Brookfield, and beyond. It is a member congregation of the Lutheran Church-Missouri Synod. We are a family of Christian believers, gathered together by the Holy Spirit in God’s Word and Sacraments. By these means of grace, we have all been united with Christ in a death like his and resurrected into his new life. Because of this shared identity, Scripture teaches us to value both our unity in Christ and the variety of gifts that we have all been given. We are one body with many parts, each working together and none more important than the others. We are one family with many members, each caring for and serving the others. Jesus Christ, fully divine and fully human, was born into human history for us. He lived the perfect life demanded in the Law for us. He died the death prescribed for all sinners for us. And he rose again offering his free gift of righteousness and forgiveness for us.This is the Gospel truth: that we were condemned because of our own sin,but Christ – God in the flesh – took that condemnation on himself for us. Through His Word and through His means of grace Christ is with us. He is with us in baptism– when our sins are buried with Christ and we are raised into his resurrection. He is with us in confession – when we confess our sin and we receive the certain proclamation of God’s forgiveness in Christ. And He is with us in communion – when we are strengthened in our new life by Jesus’ own body and blood delivered through the bread and wine we share. When we gather in His name to receive His Word and His Sacraments, He is truly with us. Because Christ is both for us and with us, He now does His work through us. We are now freed to live lives of love for God and service to our neighbor. Through us, Christ shows His love for us and with us. Visit the News, Activities, and Missions pages for more info. 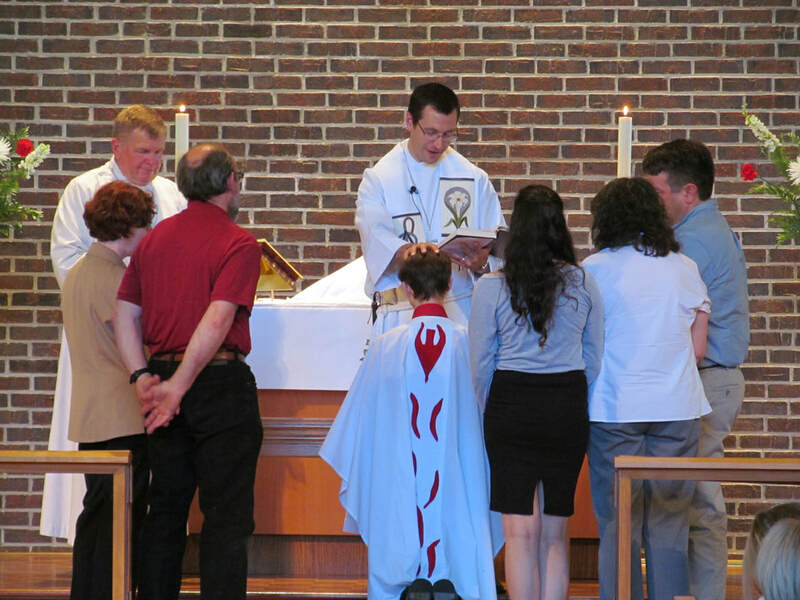 Because receiving Christ’s gifts is the heart of Christianity, worship at the Divine Service on Sunday is the heart of Christ the King Lutheran Church. In addition to Worship, we hope all will take part in our education offerings. Solid Biblical teaching helps us grow in both faith and knowledge, as we better know and appreciate the gifts Christ has given. Beyond being fed through worship and education, simply ask: What gifts has God given you? What are you passionate about? Do you have any experiences that might benefit the church or Christ’s kingdom worldwide? If your heart has been filled to overflowing by Christ’s grace,then He will use you to pour out that grace on others. Because we believe that Christ is for us, we know that Christ is with us, and we trust that He works through us. ​Visit the News, Activities, and Missions pages for more info.